Last week we revisited the garden bugs we had learned about last year. We looked back over the blog posts I had written, talking about the activities we had done and it was amazing how much information our Little Garden Helpers had remembered and they were keen to learn more. Visiting Butterfly World was a brilliant way to spark their interest and we followed up on this by making cardboard butterflies to decorate our living room. I tried to keep it simple so that Garden Lass could join in, so they each chose some sparkly card or foam which I cut into a butterfly shape. They then cut shapes from scraps of material, foam, card and paper and used these to decorate the wings. Garden Girl took great care, trying to make each wing the same, while Garden Boy spread as much as glue as he could over the wings and then carefully placed a small but select collection of shapes on his wings. Garden Lass just enjoyed joining in and stuck shapes onto her butterfly until she ran out of room. 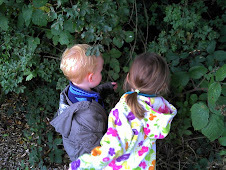 We did a bug hunt in the garden, finding butterflies, bees, moths, wasps, flies, spiders, ladybirds, snails, slugs, earwigs, black fly, a centipede, worms and ants. Garden Girl walked around with her clipboard and pencil and demanded I tell her how to write each bug we found. We talked about where we were finding each kind of insect and why. Garden Boy suggested that ladybirds liked the herb bed because 'they are my friends and they can see me there,' while Garden Girl said 'they are all on our vegetables because they are naughty and want to eat them'. As far as I can tell Garden Lass just thought they were there for her amusement and particularly enjoyed picking up ladybirds and watching them crawl up her arm. I was a little disappointed to find that there were far fewer ladybirds in our garden than last year, although there was also far less black fly, so perhaps they had just gobbled them all up and moved on to a new food source. There were many more snails, but I disposed of these whenever we found them. I assume this is due to the heavy rain we have had, or perhaps the fact that I have moved pots around less this year. Having not been pestered too much by ants on the patio this year I thought perhaps we were getting away with it but we found ant nests in two of our potato bags which we tipped out and disturbed. PS. If you want to find out information or see the activities linked with garden bugs we did last summer click the 'Teach Your Toddler' link on the right.